It is important to plan for emergency events to minimise negative impacts and assist in returning to normality as quickly as possible. This section provides practical property specific flood information and maps as well as links to assist you in developing your own personalised flood action plan. Did you know? A 1 in 100 year flood is a large flood that has a 1% chance of occurring in any year. It can be easy to think that disasters, such as flooding, won't happen to you, however history has shown us that emergencies can happen anywhere and at any time. Whilst it's important to have a plan and to know what to do in an emergency, it also just as important to be aware of the history of flooding in your area and ensure your plan takes this information into consideration. The economic cost and personal trauma within the community caused by the flooding reminds us of the need for a flood management system. 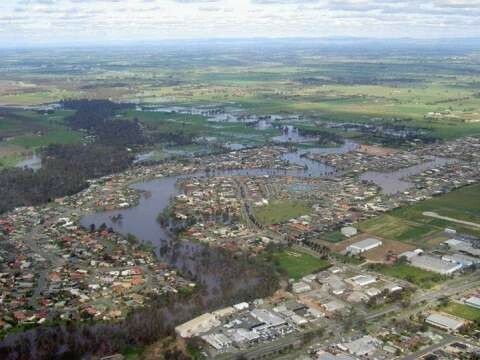 The Goulburn River has a long history of flooding, with major floods occuring in 1916, 1917, 1939, 1956, 1958, 1974, 1993 and 2010/11/12 in the Shepparton, Mooroopna and Murchison areas. Creating an Emergency Plan takes very little time and may help save your life or property during an emergency. The SES has created a comprehensive guide to help you create your Emergency Plan, which will guide you step-by-step through the process. Flood levels have been declared for major towns in the Goulburn Broken Catchment. Goulburn Broken Catchment Management Authority has provided an interactive map to give access to PDF documents which contain information on floodplain levels. View the Flood Maps on the Goulburn Broken CMA website. Prior to applying for a planning permit with Council, flood advice can be obtained directly from the Goulburn Broken CMA. Apply for flood advice via the Goulburn Broken CMA website.